is now available at Modern Palm! Included in each box set are 1 oz. tubes of shower gel, hand cream, body lotion, & a bar soap. This refreshing scent blends white flowers, ripe citrus and subtle hints of musk topped off with a light salty note. 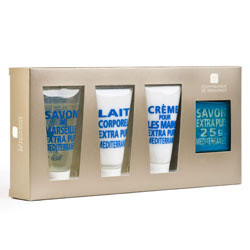 This is a great way to sample the famous Compagnie de Provence products.